More March Madness food. I swear we don't eat like this all the time. 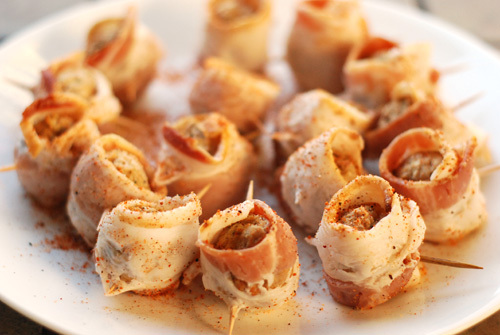 Barbecue folks have the best appetizers and best appetizer names. That's what happens when it takes hours and hours to smoke meats. You play around and cook snacks in the mean time. 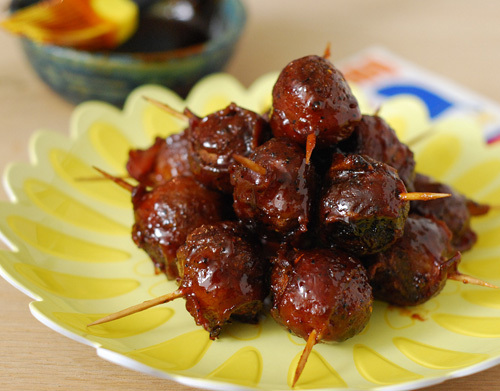 Here are some of the classic BBQ appetizers. 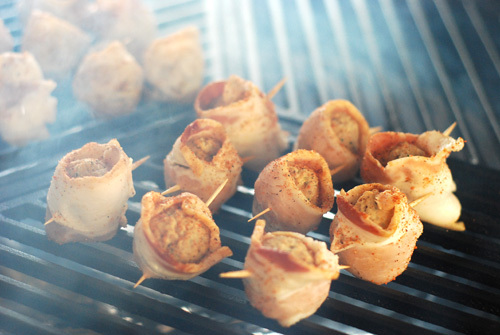 Fatty - Breakfast sausage chub stuffed with cheese, peppers, or whatever, seasoned with BBQ rub, sometimes wrapped in a bacon weave, and smoked. 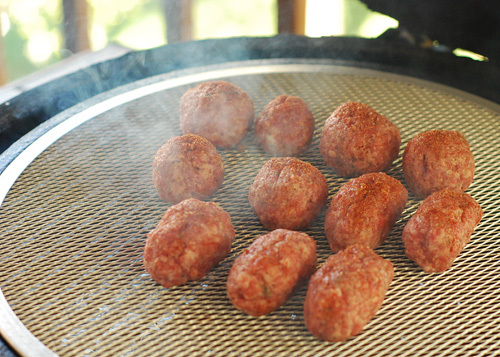 If you have ever spent 30 seconds on a BBQ forum, you have probably seen or heard of MOINK Balls because they are wildly popular. They are the creation of Larry "The BBQ Grail" Gaian. Here is the funny story behind the name. Here's the Cliff Notes version. If you don't have a smoker or smoke capable grill, you could cook these indirect at a very low heat on a gas grill. 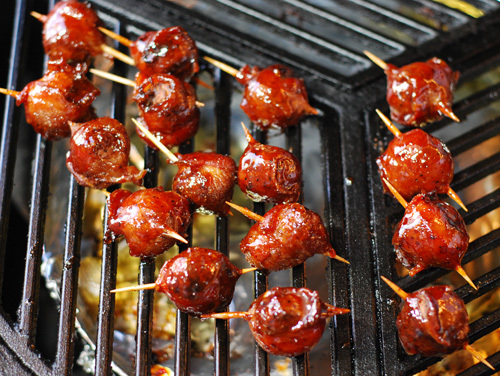 Wrap meat balls in 1/2 strips of bacon, impale with a tooth pick and season with your favorite BBQ rub. I used Drapers AP Rub. Smoke at 250f for an hour. 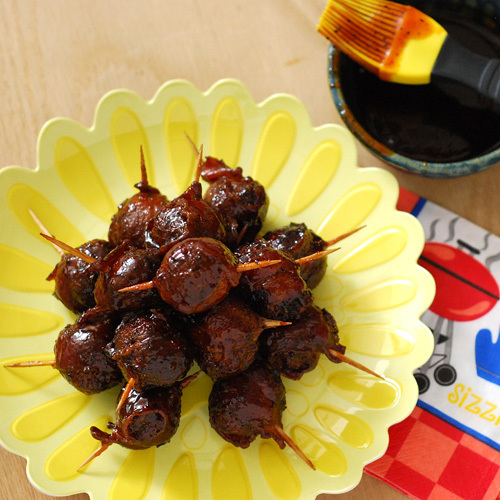 Glaze with your favorite BBQ sauce. Tonight I used Blues Hog Original. Not my favorite but my family loves the super sweet sauce. Smoke another 30 minutes. Did you know that an armadillo can grow as large at 132 pounds? I do only because Trevor had to do a research paper on the armadillo a few weeks ago. 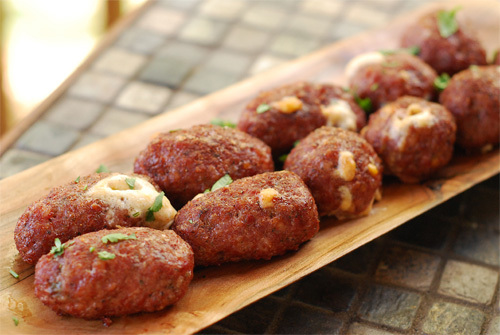 Anyway, when I first started trying to learn about barbecue 10 years ago, I heard about Armadillo eggs. They are a jalapeno (or jalapeno boat) de-seeded, stuffed with a cheese mixture, wrapped in sausage, seasoned with rub, and then smoked for an hour. It's kind of like a spice Scotch Egg without the egg. We LOVE ABT's but since the jalapeno in Amradillo Eggs is wrapped in sausage, it doesn't cook as much. That leaves it spicier and not as tender. 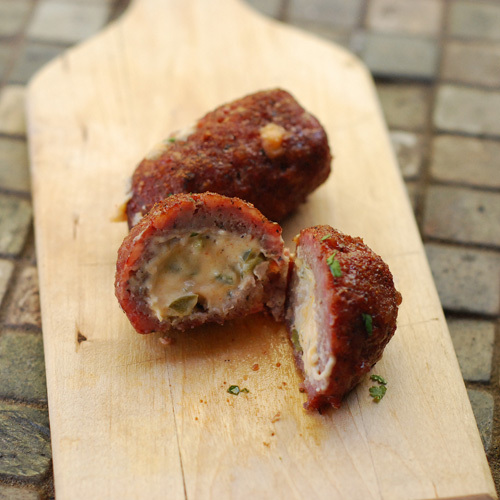 So if you like spicy, make them as Armadillo eggs. My family likes a milder version that uses a diced jalapeno/cheese stuffing. Because they turn out round, we call them Sea Turtle Eggs. Preheat a charcoal grill set up for indirect heat to 250f. Add a chunk or two of cherry, hickory or whatever smoking woods that you have on hand. 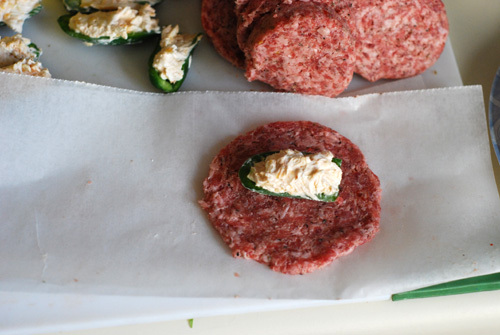 Mix the cream cheese, cheese, jalapeno and 1/2 tsp of BBQ rub together. 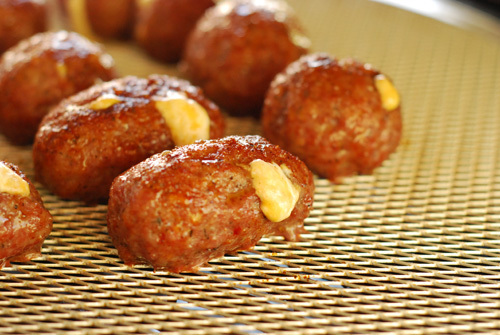 Place about 1 tsp of the cheese mixture on each slice of sausage. Pull up the edges of the sausage and seal, forming it into a round, golf ball sized "egg". Season your "eggs" with the remaining 1 tsp of BBQ rub. Smoke the "eggs" for about 90 minutes. I used whipped cream cheese...new to me, that stuff is awesomely good. Feel free to sub any other cheese. This an an armadillo egg being made. Smoking with cherry wood. Armadillo eggs in front, Sea turtle eggs in back. Don't panic if you get a few ruptures. Sea turtle egg cut open, armadillo egg in the rear. Okay, so after that weekend of March Madness food, this week requires a diet of nothing but Shredded Wheat, veggies, and a lot of exercise. But it was worth it. Labels: appetizer, BBQ, pork, tailgating, vegetable, why not?